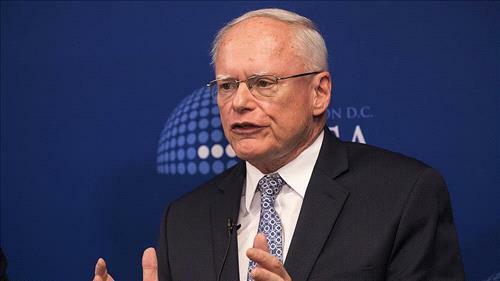 AMMONNEWS - U.S. special representative for Syria James Jeffrey will travel to Turkey and Jordan between Dec. 4-14, the State Department said Tuesday. Jeffrey will be joined by Joel Rayburn, deputy assistant secretary of state for Levant affairs and special envoy for Syria. "In Turkey, the Ambassador will meet with Turkish leaders and other senior officials to discuss the promotion of stability and security in Syria," said the department in a statement. He will also conduct a "High-Level Working Group on Syria" with Turkish officials ‎to address security concerns of the U.S. and Turkey and continue progress on issues of mutual interest regarding the Syria crisis, according to the statement. "In Jordan, Ambassador Jeffrey will meet with Senior Jordanian officials to emphasize the importance of maintaining pressure on the Syrian regime and encouraging all possible efforts to advance the political track as called for in UNSCR 2254," said the statement. Jeffrey will discuss "additional ways to ensure consistent, unhindered access to humanitarian and medical aid" for the refugees of the Rukban camp. Located in the desert on the Syrian-Jordanian border, the camp is home to nearly 60,000 refugees displaced by the ongoing conflict in Syria. "He will also meet with U.S. personnel focused on Syria policy issues from around the world," said the department. The Syrian regime has imposed a tight siege around the camp, triggering deteriorating humanitarian conditions for its residents.